Landing Height: 1/2" 3/4" 1" 1-1/4" 1-1 /2" 1-3/4" 2"
Landing Size: 60" x 48" 60" x 60" 60" x 72"
SafePath™ Products presents the first and only prefabricated product specifically designed to ensure access code compliance at most door entrances. 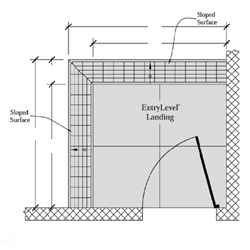 EntryLevel™ Landings offer a maneuverable level surface and sloped access for a maximum three-sided approach at door thresholds. Imagine a door threshold product installed made from 100% green sustainable material at a fraction of the cost and time of concrete demolition and construction. EntryLevel™ Landings are available with ramped access from a single side to a three-sided "path-of-travel" approach offering safe transitions while reducing risk and providing a sensible solution to access code door modification projects. Black Walk-Off Matting is available as a Custom Order, please contact us for details and pricing. StoneCap™ Landing Finish uses advanced technology with ceramic fired quartz to create an attractive, color fast and slip resistant surface. The combination of one of the planet's hardest minerals - Quartz Crystals - coated with a ceramic material, creates beautiful colors that resist bleeding or fading when exposed to harsh sunlight or the constant wear and tear of heavy foot traffic. Walk-Off Matting is a carpeted surface adhered over the rubber flat stock on an EntryLevel™ Landing. Custom colors and printing available upon request. The Manufacturer recommends Sikaflex-1a Adhesive for Installation of Rubber Threshold Ramps and Rubber Entry Level Landings. 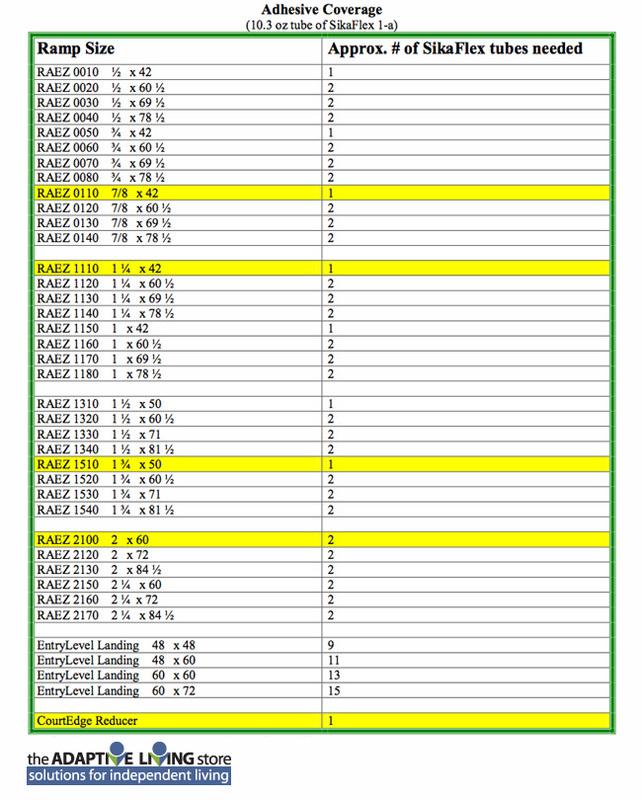 Please refer to Estimated Adhesive Chart to determine number of tubes of adhesive needed for project.